MANTECA — The Manteca Police Department reports a man refused to leave an apartment Sunday morning after shooting another man in the residence. Initial reports of the shooting came in from the man’s wife, who told police her husband had shot someone inside an apartment at 350 North Union Road. The woman’s 35-year-old husband was seen inside the apartment, watching officers as they arrived on scene. 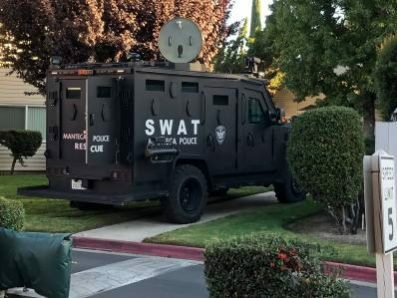 When he refused to leave and officers could not make contact with anyone inside the apartment, the SWAT Team was called in. Negotiators were able to get the man to exit the residence and he was detained by police. Officers located a man with a life-threatening gunshot wound inside the apartment. He is in critical condition at a local hospital. The shooter’s 35-year-old wife was upstairs when officers made entry into the apartment. She was uninjured. The incidents leading up to the shooting have not been reported.